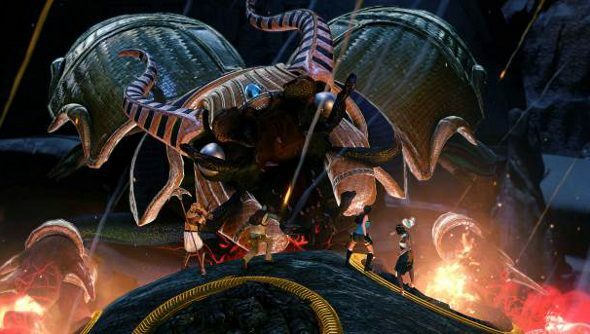 Lara Croft and the Temple of Osiris is a little bit different, taking Croft and her love of adventure and throwing her into a co-op game that’s part action RPG and part puzzle game. What isn’t different about it is how riddled it is with pre-order incentives and DLC. These things might be on the way out, with pre-orders declining, but damn if Square Enix isn’t milking the model for all its worth. So far there are three different “packs” from three different retailers. There’s the Hitman Pack that you can grab for pre-ordering the game on Steam. That nets you silly Agent 47 costumes, his guns and a ring, which confer increased weapon damage. Then there’s the Deus Ex pack, available if you nab the game on Amazon. Then, just like you’ve always wanted, you can dress up Lara and Co like Adam Jensen, use his rifle, and wear his ring – which gives you more treasure. Finally there’s the Legend Pack from Gamestop. It contains old school Tomb Raider skins, a golden pistol and a special ring offering health regen. On top of all the separate pre-order bonuses, you can buy a season pass as well. That nets you all future DLC including a bunch of other packs. The only way to get all the DLC is by purchasing the game three times. But I wouldn’t be surprised to find them for sale later down the line.